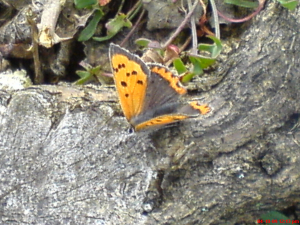 Observation - small copper butterfly - UK and Ireland. Description: I love these little butterflies ever since I saw my first one at the age of six in Wales! They are multi-brooded, even having 4 broods in some years. This photo was taken in October, so the specimen is probably third or fourth brood. I love these little butterflies ever since I saw my first one at the age of six in Wales! They are multi-brooded, even having 4 broods in some years. This photo was taken in October, so the specimen is probably third or fourth brood.